When a superclass method (an overridden method) declares that it can throw an exception then subclass method (overriding method) must also declare that it can throw the same kind of exception or a subtype of that exception. To handle the exception while you overriding a method in Java, you will have to follow three important rules. They are as follows. ➲ The overriding method can not throw any checked or compile-time exception. ➲ The overriding method can throw any unchecked or runtime exception. ➲ The overriding method can throw the same exception which is thrown by the overridden method. ➲ The overriding method can ignore the method level exception. ➲ Subclass method can throw the exception which is a subclass of the superclass method's exception. ➲ Subclass method cannot throw the exception which is a superclass of the superclass method's exception. ➲ Subclass method can throw any unchecked or runtime exception. Let's see example programs to understand all these rules. In the above example program, if the overriding method throws an unchecked exception, there will be no compile-time error. Q. What will be the error in the following program? Assumption X is superclass and Y is subclass. A. Compile-time error because the overriding method is throwing an exception which is the superclass of the superclass method' exception. i.e, Exception is the superclass of IOExecption. A. No compile-time error because Throwable is the superclass of all exception. A. Compile-time error because you cannot reduce the visibility of the inherited method from Parent. Access modifiers must be bigger or the same. A. Error because we cannot reduce the visibility while overriding method. 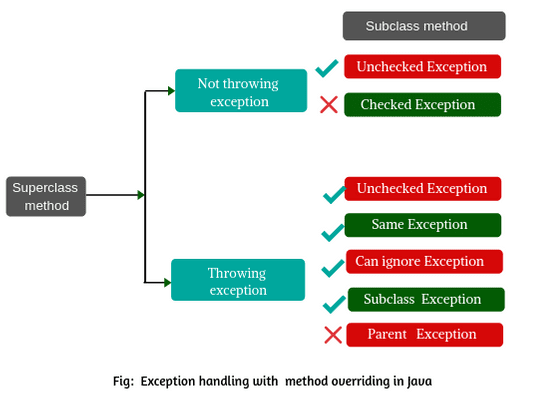 Hope that this tutorial will have helped you to understand the rules of exception handling with method overriding in Java with example programs. I hope that you will have enjoyed this tutorial.